This counter-depth refrigerator provides a built-in look, yet offers 18 cubic feet of space with lots of flexibility for food storage. Featuring an automatic filtered ice maker, plus the Twin Cooling System to help keep food fresher for longer, this fridge makes the most of its space. Includes surround air flow for maintaining optimal temperatures, EZ-Open handle for easy access to the freezer, and Power Freeze and Power Cool for quickly chilling your food. When it comes to fridges, convenience is key. That's what this GE Profile refrigerator is all about. Sporting a roomy 20.8 cu. ft. capacity, it features a French door design that keeps all your go-to foods conveniently at eye level. The handy array of bins, shelves, and drawers are all lit up for easy visibility thanks to high-efficiency Ramp up LED lighting. Give your groceries a happy home with the 24.8 cu. ft. GE French door refrigerator. Humidity-controlled drawers ensure fresh produce stays crisp, while FrostGuard technology minimizes freezer burn. Enjoy water and ice that's fresh and clean with GE's Pure and Clean Filtration system. 18 cu.ft. 3-Door French Door Counter-Depth Refrigerator with Twin Cooling in Stainless Steel This counter-depth refrigerator provides a built-in look, yet offers 18 cubic feet of space with lots of flexibility for food storage. Featuring an automatic filtered ice maker, plus the Twin Cooling System to help keep food fresher for longer, this fridge makes the most of its space. Includes surround air flow for maintaining optimal temperatures, EZ-Open handle for easy access to the freezer, and Power Freeze and Power Cool for quickly chilling your food. 18 cu.ft. 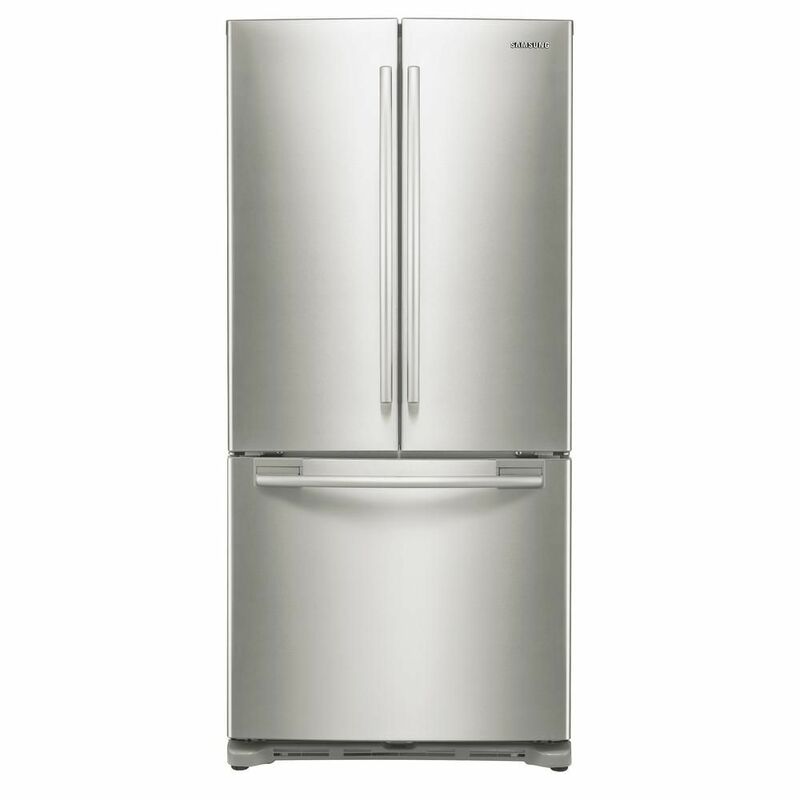 3-Door French Door Counter-Depth Refrigerator with Twin Cooling in Stainless Steel is rated 3.6 out of 5 by 821. Rated 1 out of 5 by mj662 from Look up samsung refrigerators on the internet, you will find class action lawsuits and youtube vi... Look up samsung refrigerators on the internet, you will find class action lawsuits and youtube videos with over 100,000 views showing problems with leaking water in the bottom of the fridge, bad ice makers and more. The problem is Samsung has had these same problems for years and does not fix them! CBC just did a video on somt of these problems. Samsung should be advoided! Mine just started to gather water in the bottom and in the cripser drawers and it is just over a year old! Ice Maker fills Ice tray to ful so every time you open the freezer drawer ice falls out under the drawer. What crap! Rated 5 out of 5 by Shamit from Perfect fit for my small kitchen . Counter depth. The... Perfect fit for my small kitchen . Counter depth. The compressor is slightly noticeable but overall it’s a great fridge. Rated 5 out of 5 by HomeDepotCustomer from I’m very satisfied with the fridge. Perfect size for a condo size kitchen. I’m very satisfied with the fridge. Perfect size for a condo size kitchen. Rated 4 out of 5 by Willie from Fridge is compact and fits in the kitchen. Perfect for... Fridge is compact and fits in the kitchen. Perfect for small families. Has option to turn off ice maker. Rated 5 out of 5 by James from very good looking product and perfect size.... very good looking product and perfect size. Rated 2 out of 5 by Becky from 1) Butter keeper is too small. Can only fit four... 1) Butter keeper is too small. Can only fit four sticks long way--cannot fit them facing front and be able to close its door. Seems like a flawed design.2) There is no egg tray. An egg tray in the door lessens overcrowding on shelves and protects the eggs from damage when moving things around. Rated 1 out of 5 by Screaming from Do you dream of living near a large airport where you can be lulled to sleep by the soothing soun... Do you dream of living near a large airport where you can be lulled to sleep by the soothing sounds of airplanes landing and taking off? Yes? Then purchase this refrigerator and enjoy the cacophony! This refrigerator comes complete with it's own internal mockingbird - it splendidly imitates the sound of defunct jet airliners, dentist drills, zooming race cars and - my favorite - grinding gears. With this refrigerator, you'll never feel alone again - it will moan, groan and scream at you all day AND NIGHT long! Attractive, cold and loud - just like your ex. Rated 1 out of 5 by AJS from Died at 4 years Really liked the product to begin with. However, we’ve had it about four years and the defroster stopped working. With parts and labor it’s going to cost >$600, which is half the cost of the fridge. Save yourself heartache down the road and go with a different brand. What is the width of the refrigerator? This fridge is 32.17&rdquo; wide. Is there a 65-67&rdquo; height version of this 18 cf fr/door model? 30 1/2&quot; isn't counter depth. &nbsp;Do you have any ACTUAL counter-depth fridges? I bought this fridge, but it sits low on the back end. How do u level it? There are no explanations in the instructions. &nbsp;Please help.